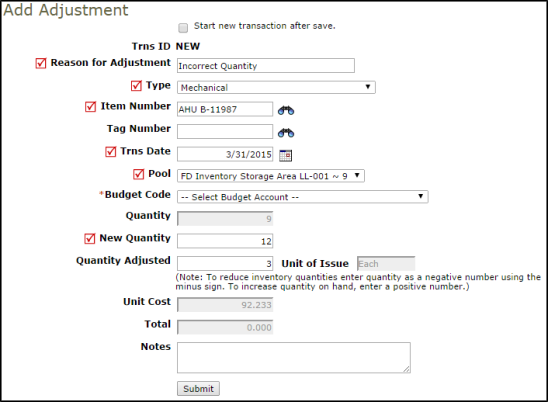 Adjustment transactions are used when you need to correct the on-hand quantity value in the system. For example, InventoryDirect indicates that you have 5 widgets in the warehouse, but you just did a physical count for all of your inventory items and you actually have 6. You can enter an adjustment to correct the total in the system. Required fields are indicated by a red check box ( ). Click on the Adjustment tab at the top of the screen. You can also click on the Adjustments link in the Information & Analysis section of the home page.